While “best” is subjective, today we’re going to talk about some of the leading night sight brands. Plu the reasons and situations where they particularly excel. But first, let’s cover some basics. A night sight comes in a couple different types…there’s the colored glass type and the tritium type, both with their own advantages. Regardless of which type or brand you choose, there are a couple things to consider when buying night sights: durability and visibility. Like most accessories, you get what you pay for. Night sights come in all price ranges. 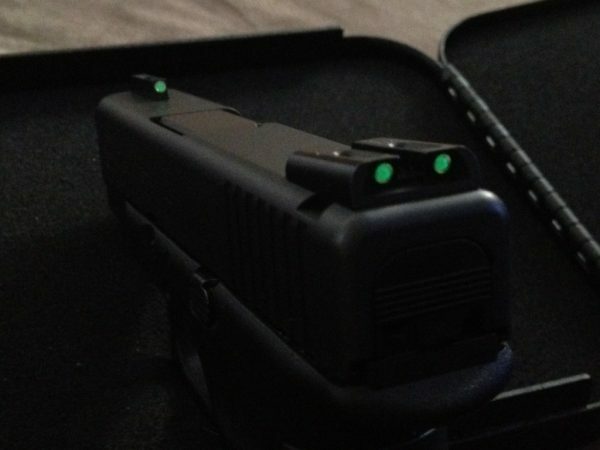 If you’re adding night sights to your carry gun, spend the money. Your life is worth it. But if you just want a sight for plinking at dusk, you can get away with something on the less expensive side. Now let’s talk about the best night sight companies. TRUGLO, if you’re interested, makes sights for a wide range of weaponry, including bows, rifles, and shotguns. For this article, though, we are going to talk about their handgun products. Where TRUGLO excels is their combination Tritium and fiber optic sight. This eliminates the shortfall of the fiber optic sight, which is needing a light source to shine through the sight to illuminate it. When you have your own light source – the tritium – you eliminate this problem. The housing for their fiber optics is also amazingly difficult to break. Breaking your fiber optic sight is a common occurrence, and many manufacturers send replacements in the package. AmeriGlo sticks to making sights for handguns only and they do it well. Their night sights are available in fiber optic, tritium, and a combination. What I like most about AmeriGlo is that you’re not limited to one style sight. Many of the manufactures on this list only have one or two styles of sights. Most common is the front sight with a single-color dot and a white outline. The rear sight has the U shape with the colored dot on either side. There is nothing wrong with that. It works. However, if you want something different, AmeriGlo has options. 14 for just the Glocks. One of their options that I can’t say I see often elsewhere is a ghost ring rear sight and tritium front sight. The rear sight has a dot on either side to help you line everything up so you aren’t just guessing where it should be in the ghost sight. And to be fair, there are more styles available, but they aren’t illuminated. I like choice. Even if it’s just the option of choosing a different color for my front and rear sights. Use AmeriGlo to get more options than just your standard front and rear night sights. The Meprolight has a night sight they call the FT Bullseye. It’s a rear sight only and it doesn’t need a front sight at all. Pretty sweet, huh? “How does that work?” you might ask. Well, think of it as if you were adding a reflex sight to your pistol, just low profile and no batteries are needed. It’s a combination of tritium and fiber optic, so again, it illuminates itself. As you aim, you’ll see a dot, and when you are on target, you will see a ring around the dot. It’s similar to lining up your front and rear sight. Not everyone likes the same style sight. Not everyone feels the way you need to line up some sights is intuitive. Most sights have you line up the dots leaving the appropriate amount of space on either side and making sure you have it lined up top to bottom as well. What XS Sights has you do is “Dot the I”. Their front sight is a colored dot with a large white ring. The rear sight is a colored line. To take aim on a target, you need to place the white dot on the top of the line on the rear sight. That’s it. When you are shooting from different distances, you can easily estimate where your bullet will impact by using a different point of reference on your sight. When you are shooting from a closer distance, the dot in the front sight is your impact point. When you are farther away than 25 feet, you aim with the top of the front sight. Trijicon is one of those companies that has a history of being in the worst places. Not business-wise or having bad PR. What I means is that they are trusted by law enforcement and the military, so they are used in places most of us are lucky enough to never need to experience. That being said, Trijicon offers a large array of scopes and sights. Their night sight offerings are your standard front blade sight and the U-shaped rear sight. However, something that stands out, or rather gives you a better field of vision is their front sight. It’s thinner, but has a large dot and surrounding colored area for easy target acquisition. Their iron sights use the glow of tritium surrounded an aluminum casing to make them more rugged. To cap that off (literally), they use a sapphire cap because it’s strong and it distributes the light more evenly. It’s the little things like these that make the Trijicon worth looking at. Got a Glock and want specific recommendations…or not looking for exactly night sights? Check out our Best Glock Sights. 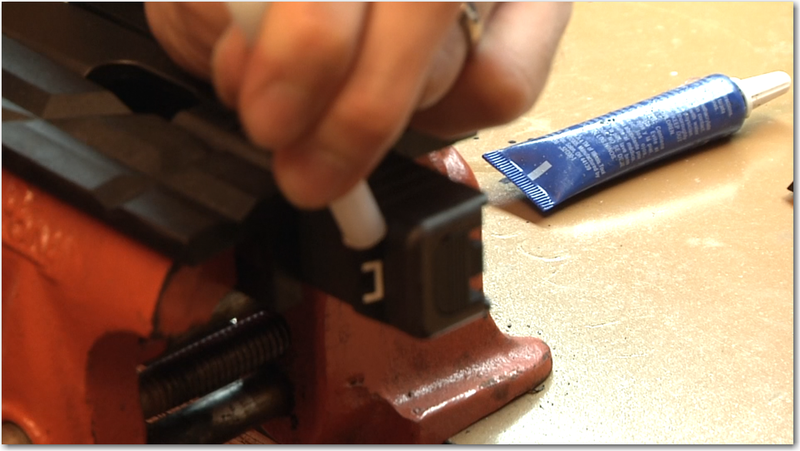 Again…I’ve found that Glocks are really easy to switch out sites…Installing Glock Sights Without a Sight Tool. But for other handguns…you’ll definitely want one. We recommend the Outdoorworx Universal Sight Pusher ($68). 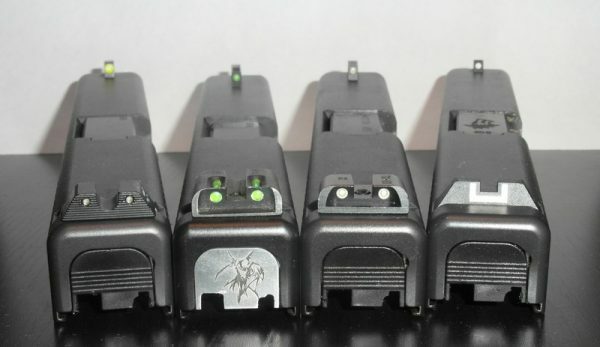 As you can see, there are a lot of manufacturers out there making night sights for your handgun. Many of them make low light sights for other weapons too, including your archery needs. The manufacturers all have their unique selling points and features. When you’re going to buy a sight to see better in low light situations, make sure you look at all your options and get what’s right for you. If you’ve been training with a factory sight and you need to totally change how you aim because of your new sight, that might be an issue. Alternatively, if you can’t hit the broad side of a barn with your current sights, you can look into some of these that offer a way to acquire your target more easily. It’s all about you and what you need. Do you have a preference when it comes to a night sight for your handgun? Fiber or tritium, a specific color? Give us your two cents below. I’ve had the XS Big Dots installed for about a year now and couldn’t be happier. Hands down the best sights I’ve had in terms of meeting my personal needs: fast sight acquisition/alignment for everyday carry. Not precision sights, but I’m not a precision shooter. 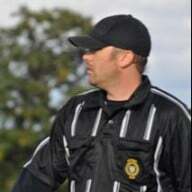 Great article as always! I often put more weight on these types of articles from Pew Pew than others. Question: Could you point me in the right direction for night sights on an FN 509? I’m having a hard time finding sights for it, thanks! Would have been helpful to have mentioned lifespans of the different types. Priceranges also vary widely. Good tip! The tritium used in most night sights have a half-life of ~12.5 years so that means in 12.5 years it becomes half the brightness. My oldest set is at ~8 years and still is good for night shooting.